Cippolini Onions, Dill Blossoms, Leeks, Watermelons, Cantaloupes, Katahdin Mint, Many interesting potatoes: Early Ohio, Kerr’s Pink, Magic Molly, Augusta, Purple Majesty…. This week summer is actually trying to kick in, play catch-up, send us some tomatoes (ask us about paste tomatoes…). We’ve got watermelons, peppers, eggplant galore. It’s tough to keep up with the activity! 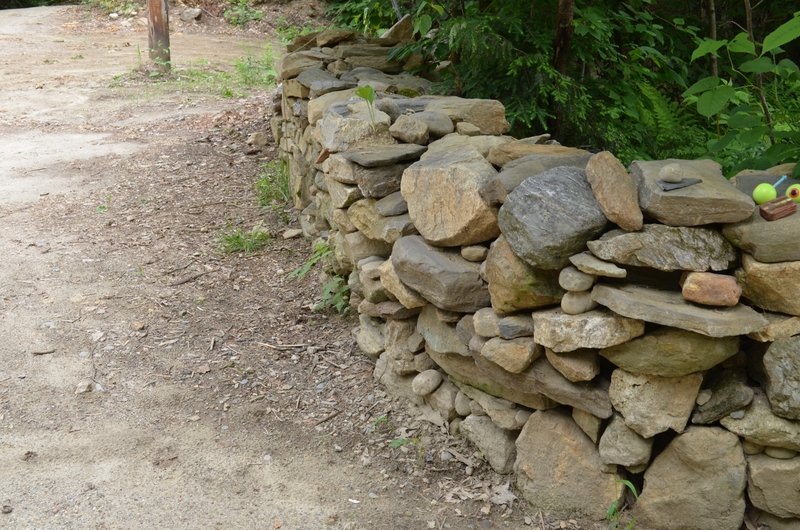 To put things in perspective, I like this stonewall my partner Ryan built at his Volvo shop in Litchfield. Now, let’s just say he’s not the type of guy to buy rocks for an entry wall. And let’s just say that’s the tip of the Ryan iceberg. The wall reminds me that the pieces we need to introduce ourselves and our food to newcomers are right at hand. How we put them together is an artform, and can have any number of forms. The facts that the rocks in Litchfield aren’t granite, aren’t uniform, aren’t even all that pretty to look at on their own, are irrelevant. We can build what we need for Maine’s food future from the materials at hand, though fitting them together is going to take creativity, a bit of sweat, and the presence of enthusiastic young children (as I’m sure ours were with Ryan when he built this wall). At the end of the construction we’ve got something (a wall, a food system), that we could barely see peaking up out of the driveway, forest floor, garden edge, lawn. What could be obstacles become our building blocks, what could be homespun becomes our unique advantage. This year Maine corn and beans are hot commodities in the Boston Market. Our spring, though wet enough, was more stable than that of our southern New England counterparts. Tables are turning, in more ways than one. Customers are looking for the signs of a well crafted food supply…we can show them the way into Maine’s.